The idea behind this blog is to educate/help/enlighten and not to create controversy or to incite. The opinions and views expressed on this blog are purely personal. Please be soft in your language, respect Copyrights and provide credits/links wherever possible.The blog team indemnifies itself of any legal issues that may arise out of any information/ views posted by anyone on the blog. As reported in the media recently, the Chief Justice of Meghalaya "passed orders" on the eve of his retirement that ‘Z’ security cover for him should continue. So far one thought that security cover of any category and reviewing it is the job of the Centre. But who can question the judiciary where even RTI is taboo. How many such Lordships are enjoying security cover post retirement is not known albeit their numbers may be small given the paucity of judges. Visiting US Secretary of State John Kerry, however, singled out another category of lordships - our bureaucracy. The 7th CPC notwithstanding, best perks for these lordships came during rule of Manmohan Singh (himself a bureaucrat), who institutionalised that all political office bearers and bureaucrats or their spouse could go abroad for medical treatment with one attendant – all expenses (attendant included) of travel, stay, treatment borne by government exchequer. Post exposure a case has become public where a whopping Rs 14 crore was spent on the medical treatment of just one spouse abroad. When a public furor was raised about the burden on such expenditures on the the overall burden to the government in such cases, the only response was that cases of these nature are screened thoroughly. This practice of medical-tourism continues though foreigners come to India for medical treatment. Of course Manmohan Singh couldn’t be expected to say he was doing so having snatched morsel from the poor’s mouth. Speaking at IIT Delhi, John Kerry virtually lambasted our bureaucracy, making the following points during his address: red tape and a lack of transparency continue to deter entrepreneurs and foreign investors even though India is now the world's fastest-growing economy; impressive gains in India's economic growth are witnessed but there is real question whether this is being done quickly enough for India to create jobs for the 13 million people who enter the labour market every year. Indian entrepreneurs urgently need freedom to pursue new ideas, the ability to start new businesses without lot of red tape, and access to infrastructure that makes it easier to translate fresh concepts into successful companies. The US secretary of state also said that India must have sensible regulations and the bureaucracy needs to be streamlined and effective -- a partner in making decisions, not an expert in setting up roadblocks. Actually Kerry was only reiterating what is well known and because of which a whole cross-section within India has been pointing out urgent need for the Prime Minister to effect administrative reforms speedily. As per World Bank ranking, we continue to be ranked 130th in the world for doing business though the PM had promised to rid India of its reputation as one of the world's hardest places to do business. Admittedly this is not an easy task but then moving slow on this account is at the cost of rise of India – bureaucracy can’t be put above India First. Tharman Shanmugaratnam, Deputy Prime Minister of Singapore attending the Transforming India Lecture Series organised by NITI Ayog on 26 August 2016 was quoted in the media saying that India cannot afford to continue scoring singles but instead must go for sixes. Whether this was because of his own love of cricket or he know India’s penchant for the game, his obvious reference was for the need to make radical changes rendered impossible with the existing bureaucracy. Incidentally, Singapore was one of the most corrupt countries at one time till the equivalent of Lokpal was instituted and overnight 150 corrupt politicians were jailed – an impossibility in India. 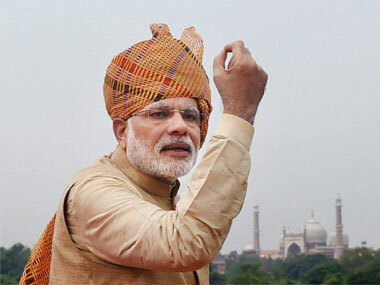 Modi himself delivering the inaugural address at the Transforming India Lecture Series, said, "We cannot march through the 21st century with the administrative systems of the 19th century." His call hinted at rapid transformation of the administrative systems. But nothing much has happened beyond some bureaucrats being retired and a report about an odd bureaucrat spoken to by the PM at 10 pm concerning road construction in Tripura. But administrative traditions in the Ministry of Defence have been the very basis of crippling the defence of India. Bulk of the British era ICS officers staying back in India manned the defence ministry, switching designation from ICS to IAS. These bureaucrats known for their disdain for the military were buoyed by Nehru’s pearls of wisdom recorded during briefing by the Army Chief on dangers to India’s national security, saying, “We don’t need defence policy, our defence policy isahimsa. We see no military threats. As far as I am concerned you can scrap the army. Police are good enough to meet our security needs.” Talking of Nehru’s mistakes, Tibet and Aksai Chin find mention but not many talk about the biggest strategic blunder Nehru made in declaring unilateral ceasefire and approaching UN when our army was pursuing fleeing Pakistanis, giving Pakistan a border with China it never had. Unfortunately, nothing has been done to restructure the defence ministry and induct military professionals by the present government either despite completing more than two years in office. No effort has been made to integrate the HQ Integrate Defence Staff (IDS) with the defence ministry either. Even the US Department of Defence and US military delegation that came to attend the first Indo-US Defence Planning Group meeting at New Delhi in aftermath of 9/11 could not believe that our Ministry of Defence is manned exclusively by bureaucrats. Posting of a former CISC who headed HQ IDS as ‘advisor’ to the defence minister is a poor face saving measure. But the biggest joke going around is that the oncologist who is current Minister of State for Defence, and who as per media reports is not being sent any files on the instructions of the defence minister, has been posted to the ministry to cure the cancerous bureaucracy. But most importantly, the prestige of the soldier has been severely hit and the his dues denied under the present government whether by design or default, grant of partial OROP notwithstanding. In his address at the Transforming India Lecture Series, Modi reflected on an exercise he has undertaken as “structured” brainstorming sessions with bankers, police officers, secretaries to the government and others. Does this imply that the military is nowhere in his priority, Make in India notwithstanding. Is this why military reforms are restricted to cutting the flab only? We may continue to boast about big-ticket defence acquisitions but why is the soldier denied modern small arms, bulletproof jackets, night vision equipment and the like? The indigenous private sector other than some big business houses is exasperated. Foreign firms are equally agitated over the stonewalling attitude of the bureaucracy, corruption and an onerous tax regime. If the US has accorded us ‘Major Defence Partner’ status and we have access to about 90 percent state-of-the-art US technology, we can only capitalise on it by integrating indigenous private industry. There is talk that caste, reservations and quota system has brought in mediocrity in the bureaucracy, but where do you see a stop to it? The question remains whether Modi can transform the administrative machinery and undertake speedy defence reforms, because perhaps no one else can, in a backdrop where bureaucracy is part of the mafia serving as conduit for providing essential financial muscle for elections. Can Modi do another NITI Aayog and replace Ministry of Defence with a Department of Defence manned by military professional, or will the bureaucracy continue to have the last laugh? The author is veteran Lt Gen of Indian Army. A soldier and God are remembered only in desperate situations and quickly forgotton when crisis is over.This country has problems galore ...dwindling fauzi izzat is one out of many.This country needs overhauling and not cosmetics bit question is who will bell the cat when there is no bell.things are not looking good at all...something need to be done by all (not only govt) and quickly else things will become unmanagable by any amout of leadership or sacrifices. Hope its not a cancer of sorts and we are taking it as a pimple? God bless my nation! Military is to blame itself for the situation it is in.Contrary to popular belief, it is a house divided against itself.For example, even to start with, an IPS has a single designation of 'IPS" and cap with common national emblem.Any one who has seen the POP of any military academy will be amused to see variety of caps, emblems etc. with no common designation/emblem on shoulders like that of an IPS to identify it with an integrated national service. Then we have officers being posted by their own kind to deputations below their equivalence level.It is pity that they have not been able to get even the official equivalence table with civilians even till now, the reason for which the case of Saurabh Kalia could not be taken to International war tribunal at Geneva.Units are still based on regional/caste basis after 70 years of independence.Instead of single Ex service men association which could speak for ex service men as well for serving personnel( since there is no window for them), there are hundreds of ex servicemen associations , each beating its own drum. This could effectively serve as a strong organization on the negotiating table in matter of common interests like pay and pensions.These are just few examples. Obviously our armed forces have not evolved themselves compared to civilian institutions and as such, any comparison between the two is futile.They should put their own house in order first and develop a national identity for their folk instead of blaming others and develop as a modern Indian institution, shedding colonial baggage. Unfortunately, this piece comes from a civilian. Dear Friends,On 04.3.10 Someone(Scotland Address)hacked e-mail gavinivn@gmail.com & had been misusing for wrongful monetory gain. Please do not believe any story from this e-mail, with the name G Venkatanarayana (impersonated by hacker) seeking for any help, financial or otherwise. Thanks. After Modi's Roar in raily Embattled In Pakistan. WHOSE LIFE IS MORE IMPORTANT? WHY SHOULD WE TRUST YOU, MR PARRIKAR ? THE SERVICE CHIEFS HAVE STOOD THEIR GROUND !